Just like most foodies, I am totally obsessed with the Food Network channel. Even though the chefs don’t necessarily make any of the food I’m “into” — aka, nutritious food… they throw around three sticks of butter like it’s no big deal! — I just love each of their personalities and I love watching them cook and talk on camera. Side Note: How do they do that?! If I engage in a conversation while I’m baking I forget what step I’m on and what ingredients I have already put into the mixing bowl. So, I guess I watch the chefs because I am also jealous of their multitasking abilities. Well, I think the opposite (sorry, Ina). 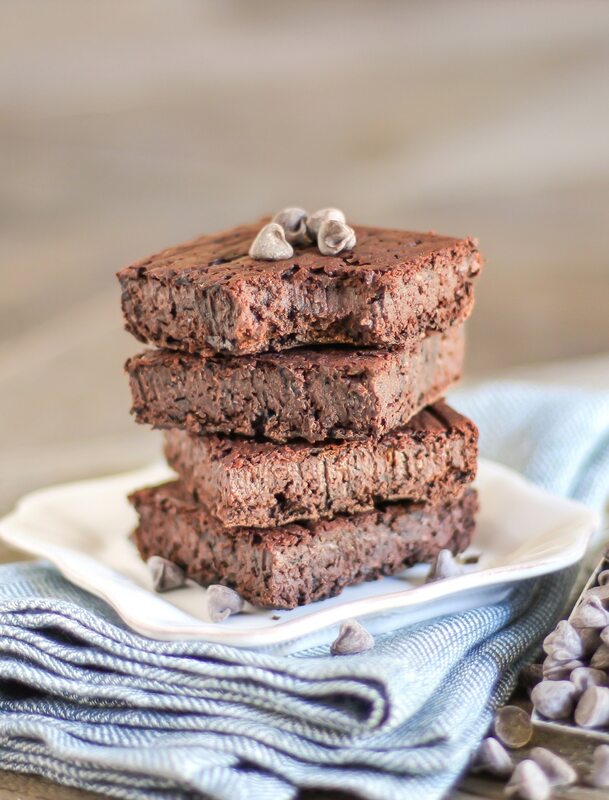 You will get the same fudgy results, same chocolate flavor, and same “oh-my-gosh-this-must-be-going-straight-to-my-hips” reaction from both Ina’s butter-filled brownies and this healthified brownie. And the good thing about these brownies is that they aren’t heading anywhere near your hips. 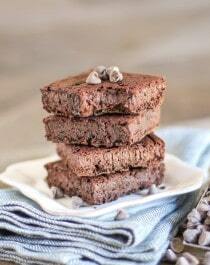 These are some brownies that you can sink your teeth into. Fudgy, moist, chocolatey, rich — who needs the butter, sugar and eggs?! I just love the idea of “healthy brownies” without the slabs of butter like you said you see those chefs use on cooking shows. these look so yum! These brownies look beautiful. I’m wondering if there’s anything I could use instead of the margarine? These look amazing! I love when you do vegan treats, I always want to make them ASAP. And you can definitely omit the coffee, it’s just there to enhance the chocolate flavor. If you want, you can add another teaspoon of vanilla extract, since vanilla does the same thing. Enjoy! These look so yummy!!! I want to make these now! These look awesome! Do you think it would work if I used a flax or chia egg instead of the Ener-G replacer? I made these and they were amazing! I ate them with vanilla fro-yo. 🙂 I think I like your black bean brownies better, but these are still delicious! The sweetener came in today, so I decided to give this a try. However, I couldnt find the shortening you used so I substitute it with Smart Balance light buttery spread. I also used regular eggs. The result taste great but somehow the texture isnt good like yours. The brownie is also a little bit dry and hard on the edge. Anyway I like your recipe, I’ll give it another try. To make these gluten free, can not use instant coffee. What would be a good substitute for that? I do understand that coffee enhances the chocolate flavor. I can drink maxwell house, brewed. Would appreciate any suggestions, thank you. To replace the instant coffee, mix the egg replacer powder with 6 tbs of prepared coffee (that has been cooled to room temperature) instead of water. Hope you like the brownies! So i’ve a strange question but i think its pretty valid! What exactly is “non-hydrogenated vegetable shortening” that you call for alot in your recipes? We dont have “shortenting” in ireland, and the closest thing i can ever find to what it seems to be (i’ve googled the ingredients etc) is a vegetable spread/alternative to dairy spread. We stock this http://www.kerrylowlow.com/Brands/Brand.aspx?BrandId=2 in our house, (i know this isnt shortening – its low fat buttery spread), but would you still consider it to be a good option? Its got no trans fats or hydrogenated oils, and it bakes up decently when i have to use it for some recipe. Sorry for the random question, it was just bugging me!! If you want to substitute the Non-Hydrogenated Vegetable Shortening, you can use organic butter or coconut oil. Both should work! In this recipe though, you can use a liquid oil too, preferably one that’s neutral in flavor, like grapeseed oil or non-gmo canola oil. Hi Jess, I like your new page. I noticed you use liquid stevia alot. I have more powdered than anything else. Can you give me an equal ratio to use with your baking recipes? Thanks.